The Security Council, meeting concurrently with the General Assembly, this morning elected Stephen Schwebel (United States) and Abdallah Fikri El-Khani (Syria) to serve on the International Court of Justice. They fill vacancies left by the deaths of Richard R. Baxter (United States) and Salah El Dine Tarazi (Syria). The President of the Council also extended the Council’s condolences to the Soviet representative on Aleksei Kosygin’s death, welcomed the newly-elected non-permanent members of the Council, and paid tribute to out-going Council President Donald McHenry (United States). 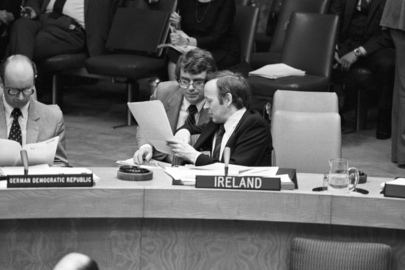 Noel Dorr, seen here conferring with an aid, represented Ireland at the meeting today as one of the newly-elected non-permanent members of the Council.